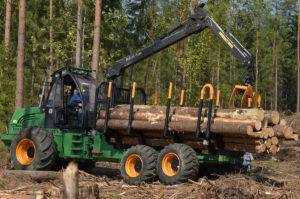 Wood industry of Ukraine from January 2019 switched to new national wood standards harmonized with the European ones, the State Forest Resources Agency of Ukraine has reported. According to the report, from 2019, commercial (round) timber will be distributed into four quality classes (A-D) without mentioning the purpose of using it. A type timber is the highest class timber, B – medium class timber, C – below medium with minor defects and D – timber that does not meet the requirements of A-C types, but could be used for lumber. The rest of round timber is divided into industrial (length of 2-4 meters, could be used for production of chips or fuel) and nonindustrial (up to 2 meters of length, could be used for fuel). The agency said that earlier timber was divided into three types and types depending on the purpose of using it. In addition, from January 1, 2019, internal consumption of Ukrainian round logs is restricted to 25 million cubic meters a year. The law amending some Ukrainian laws regarding preservation of Ukrainian forests and preventing illegal imports of logs contains this requirement. According to the law, punishment for illegal logging and destruction of forest and young trees is toughened from January 1, 2019.